One of the difficulties when travelling overseas is understanding the language of another country. As an English speaker with some high school German and French in my travel toolkit, it’s been relatively easy to get by in some parts of Europe but deciphering the language in Japan was another matter entirely. My travel companion in Tokyo was my sister, who has been both a student and teacher of Japanese for many years and also lived in Japan. It was great for me – I had my own personal tour guide, but the effort of constant concentration was, at times, very tiring for her. So when we came across opportunities for free English-speaking guided tours at two major sites in Tokyo we were happy to take advantage of them. 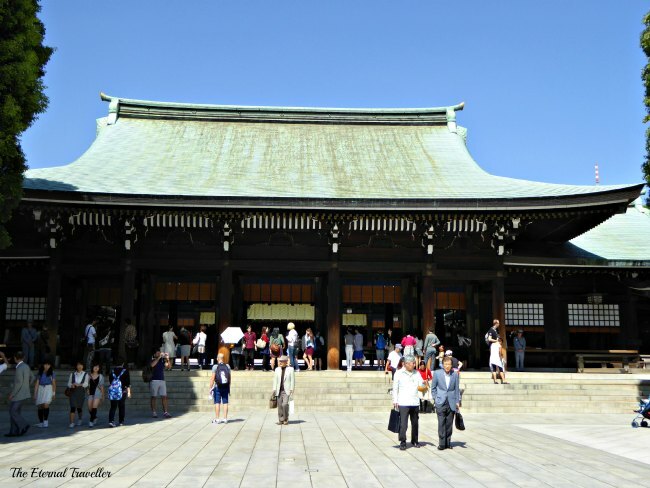 Although Meiji Jingū, a Shinto shrine dedicated to the Emperor Meiji, is located in one of the busiest areas of central Tokyo its position at the centre of 247 acres of forest guarantees a peaceful visit. As we approached the torii gate at the entrance we noticed two older gentlemen sitting at a desk with a sign offering free tours in English. We soon found out they were members of an English speaking club and taking visitors on tours of the shrine gave them opportunities to practise their language skills. Our guide was Yoshio san, a retired primary school teacher. 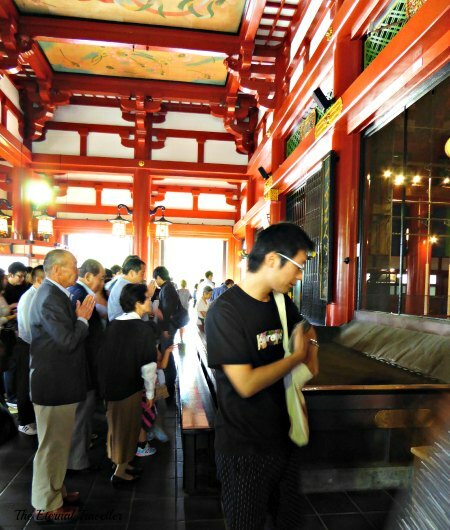 “I work part time for a tour company,” he told us, “so I need to have good English.” Yoshio san’s knowledge of the shrine and his enthusiasm for its history was infectious. 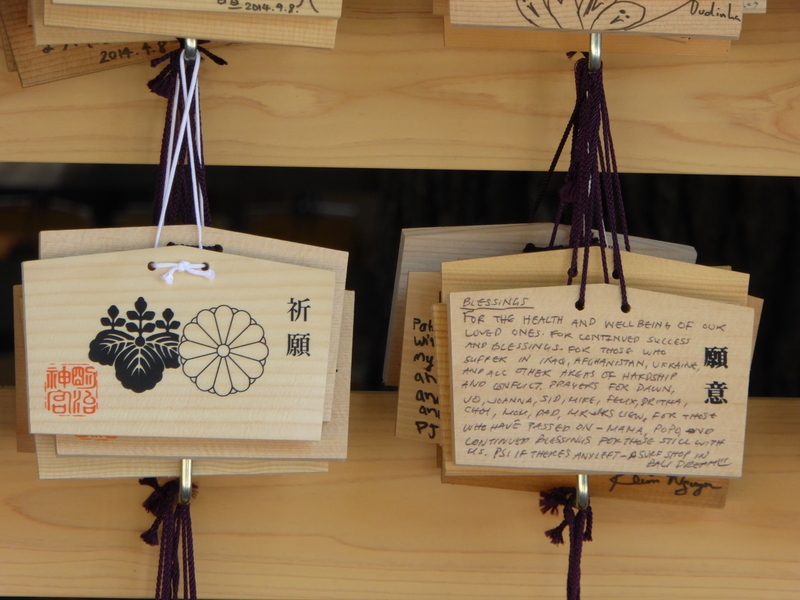 We were soon engaged in lessons on purification, making offerings and writing prayers on an ema, a small wooden plate purchased at one of the many stalls outside the shrine. 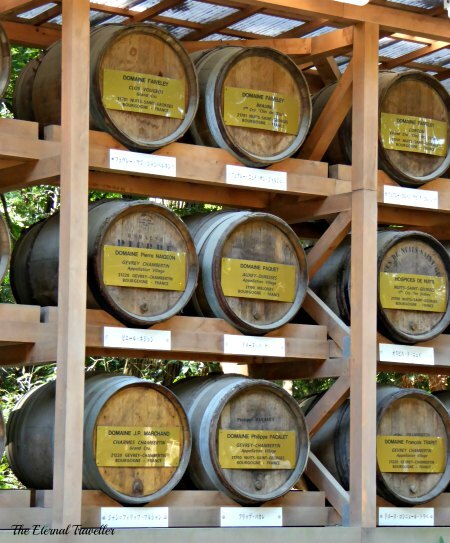 Yoshio san explained the wall of barrels of wine, donated by the wineries of Bourgogne in France; among the aspects of western culture Emperor Meiji adopted was the habit of enjoying a glass of wine with his meal. 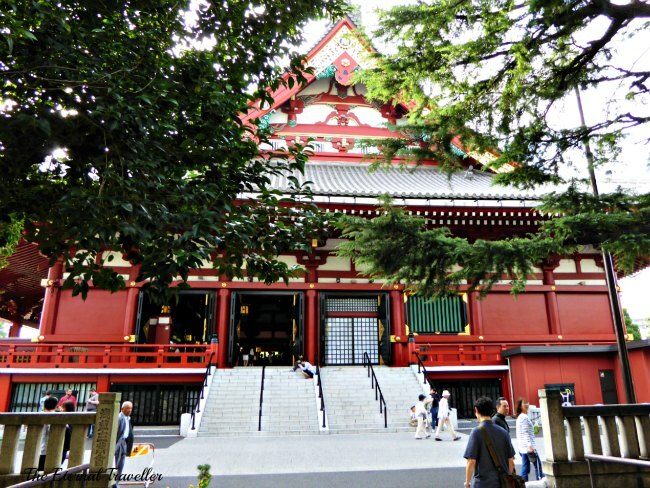 He pointed out the corner of the main path leading to the shrine. It’s an 88° angle because the number nine is considered to be bad luck. 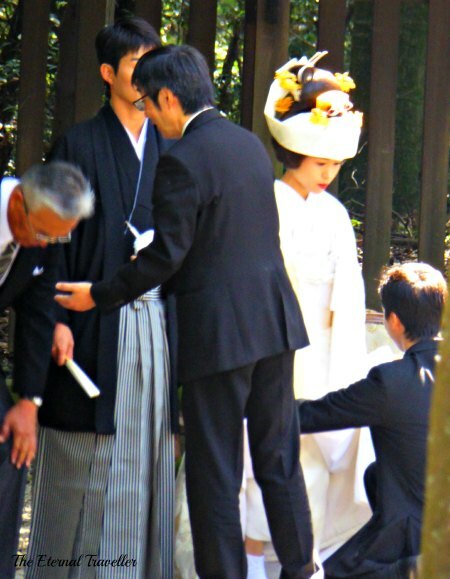 After 30 minutes of fascinating conversation, Yoshio san left us watching while one of many traditional Shinto wedding parties prepared for photographs. 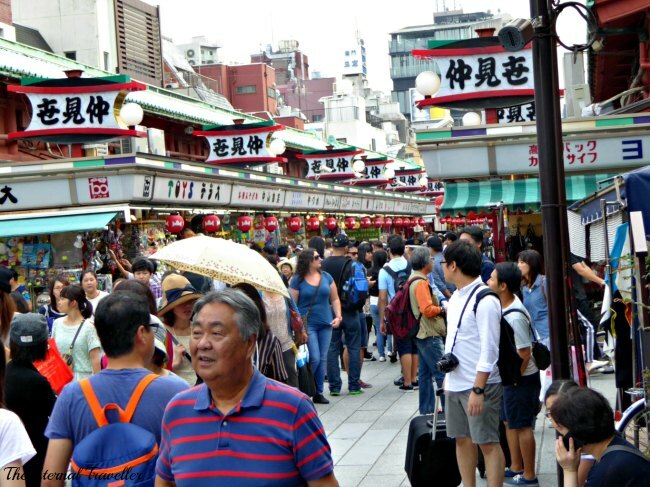 Our second free English tour was at Sensoji Temple in the bustling tourist area of Asakusa. This time we were approached by a group of Uni students who belonged to a University English club. “Would you come on our free tour? 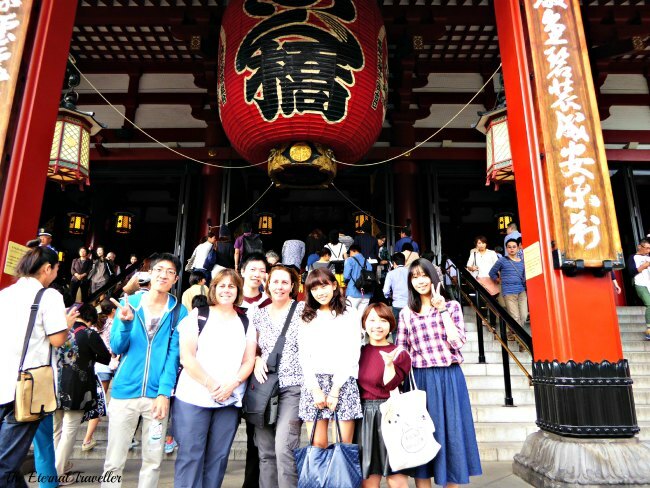 We like to practise our English with tourists,” asked the leader of the group, Ryo san. Together we walked along Nakamise, a centuries-old shopping street filled with vendors selling souvenirs and traditional food, through Hozomon, the temple gate and in to the temple complex. 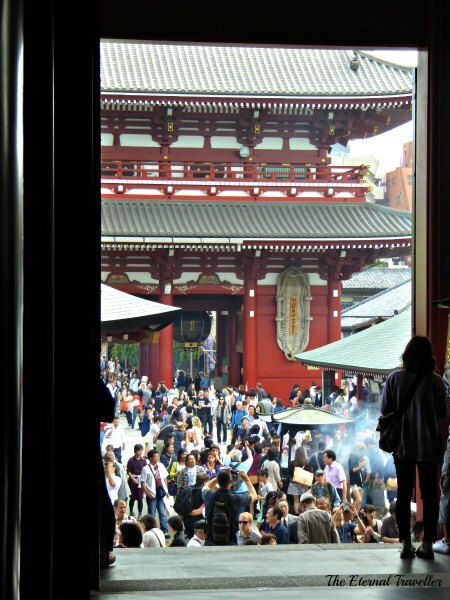 Built in 645AD, Sensoji is Tokyo’s oldest and most popular Buddhist temple. Ryo san and his friends walked with us around the gardens, waited patiently while we took photos and told us about their university studies. Inside the temple we were guided to the main hall where we waited our turn to say a quick prayer to Kannon, the goddess of mercy, to whom the temple is dedicated. After the friendly students left us, we wandered again through the hall and around the gardens. 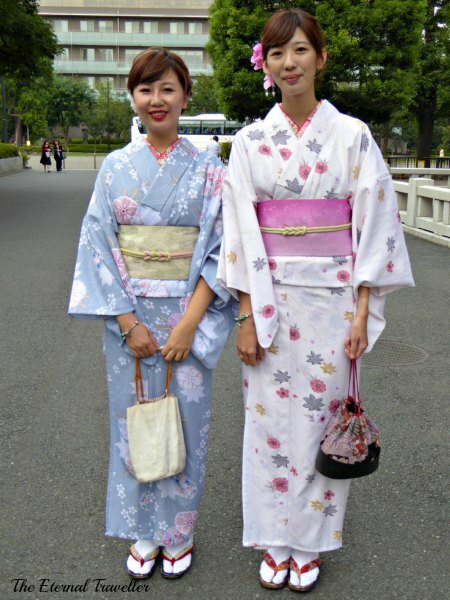 We came across two young girls, beautifully dressed in traditional kimono. My sister resumed her role of tour guide, approached them and said in Japanese, “You look very beautiful. May we take your photo?” We were taken aback when they answered her question with a question of their own. “Do you speak English?” they asked. It turned out they were tourists too, visiting from Taiwan and enjoying an afternoon of elegant dress-ups! They had us fooled! We are lucky that so many countries encourage English as a second language. Your photos bring back memories of our experience in Japan. Yes, it does make life on the road that much easier. Glad you enjoyed the photos. Your trip to Japan was truly epic! It’s really interesting, I’ve never been to a genuine Asian country (only Turkey, but that doesn’t count). How long have you been in Japan? We were there for 8 full days and we made the most of it. We based ourselves in Tokyo and saw lots of places. It was a great holiday. I’m glad you’re enjoying my stories. the inside line on all things Japanese (aren’t sisters great), super pot photo and fantastic weather to boot #luckyyou. Thanks MrsC. My sister is amazing and we love travelling together. 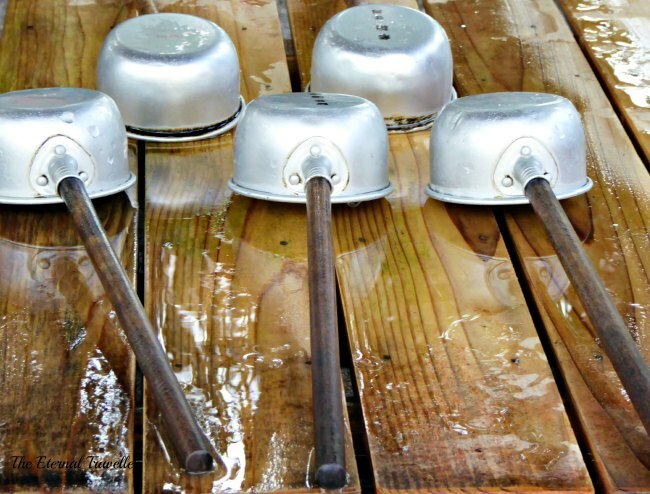 The dippers are used for cleansing before praying…aren’t they nice all lined up. Having a sister who speaks Japanese was a great opportunity to see the inside of Japan. And that was cute about the women from Taiwan – I wonder what Taiwanese traditional dress is like? I’m not sure what their traditional dress would be. I must look it up. We thought it was pretty funny that the only two girls we saw in traditional costumes weren’t even Japanese. I was very lucky to go with my sister. The best part was that she knew how the transport system works. There is more than one operator for all the trains and you have to know which ticket to buy. Very tricky! That’s a great trade-English lessons for English practice! I found that they were very eager to practice their English with us too 🙂 Those two girls look gorgeous! I think we got more out of these exchanges than they did. I’ve always found the Asian languages the hardest to get my head (or tongue) around. Vietnamese has probably been the hardest. It sounds one way or another like you’ll be visiting Japan again. Having a second language is such an achievement. I think Japanese would be more useful than Indonesian. Absolutely agree. Unless you’re the “let’s go to Bali every year to buy cheap t-shirts and rip-off dvds”, I don’t see the point, really…. And even when I do have a little knowledge of French and German, my confidence falls apart when I try to speak. But it is very handy for reading signs and timetables. We got such a surprise. They looked so gorgeous we took their photo anyway and it’s made a good ending for my story! Free tours with a local are always good news, and your sister had a chance to just relax and enjoy. Wierd the 88 degrees because number 9’s unlucky! I wonder where that originates. 🙂 Many thanks for your interesting contributions. I read that 8 is a lucky number in Japan. Maybe that’s part of the reason. Love this post, what a delight to trip down memory lane for me. When I visited Japan, I was staying at the University, everyone wanted to talk to me, to practice their English, so although a little clunky, we managed. Pretty fabulous that English is one of the most commonly spoken languages around the world. We found there was information in English at most places we visited. I also found they were thrilled when I used my very limited knowledge of Japanese to say thank you when I was served in a shop. I think it goes both ways.